A materials scientist and a battery expert from PNNL were inducted into the Washington State Academy of Sciences. Suresh Baskaran and Jun Liu were selected for their outstanding scientific achievements and leadership. Their election brings the total of current PNNL staff who are WSAS members to 16. Academy members provide expert scientific and engineering analysis to inform public policy-making, and work to increase the role and visibility of science in Washington state. The academy was created in 2005 and consists of members from diverse academic disciplines and industries, including aerospace, agriculture, computer, science, energy, engineering, ecology and transportation. WSAS inducted 24 members inducted this year, bringing the total number of active members to 264. The incoming members were honored at the academy's annual meeting in Seattle in mid-September. Baskaran is the chief science and technology officer for energy and environmental research at PNNL. He is responsible for directing science and technology investments to deliver solutions for the nation's most important energy and environment challenges. 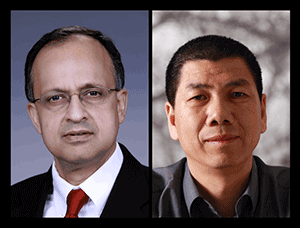 He was recognized for development of new materials for automotive, fuel cell, and microelectronic applications; leadership of hydrogen and gas separations research; and leadership in advancing energy efficiency and renewable energy technologies. His research is reflected in 50 technical papers, ten U.S. patents, and an R&D 100 award for automotive emissions control given by R&D Magazine for the most technologically significant new innovations of the year. He earned his Ph.D. in Ceramic Engineering at the University of Illinois at Urbana-Champaign.